This is a page about INAGRAL Exhibition III: A Ramble down the Tōkaidō Road – Travelling with Hokusai along the Fifty-Three Stations for the Sumida Hokusai Museum. Utagawa Hiroshige comes to mind when talking about the 53 Stations of the Tōkaidō, but Katsushika Hokusai also worked on a large number of the motif 30 years earlier, which stood out from those of other painters of the era. Unlike Hiroshige, who mainly painted landscapes, Hokusai painted small, detailed depictions of the customs of the land. In this exhibition, we’ll be unveiling the precious Shunkyō Go Jū San-Da no Uchi, shozuri*set from Hokusai’s 53 Stations of the Tōkaidō series (with half being exhibited in the first period and the other half in the second period). We introduce the many aspects of the world of Hokusai’s 53 Stations, with exhibitions on every series, topic, and more. Succumb to the charm of Hokusai’s unique 53 Stations of the Tōkaidō series in an exhibition made up of five distinct elements. The word defines as first editions in modern publishing, and are the best condition woodblock prints, with finely carved detailed expressions. The intentions of the original artist are thus best reflected in terms of color, among other factors. * We will be changing some exhibits between the first and second periods to protect the artwork. 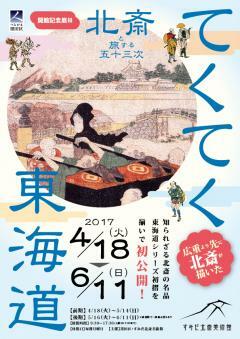 With various Edo period ukiyo-e and literary works like Hishikawa Moronobu’s A Charted Map of the Tokaido (National Museum of Japanese History collection), and Jippensha Ikku’s Tōkaidōchū Hizakurige (General Library, The University of Tokyo collection), we introduce the Tōkaidō road as it was known among common folk of the day. We exhibit Hokusai’s Tōkaidō series from the Sumida Hokusai Museum collection. Unavailable anywhere else, shozuri set of the Shunkyo Go Ju San-Da no Uchi is a must-see. Exotic food and sights, mystical places and more! Hokusai’s 53 Stations of the Tōkaidō is exhibited thematically here, without just sticking to the series and the post towns. In a complete 180° turn for Hokusai, who up until now had focused on people in his Tōkaidō series, this is a surprising piece that shows the Tōkaidō road from Edo to Kyoto in one map from a bird's eye view. Take a look at these masterful bird's eye views from an age without tall buildings or planes. Hokusai’s depiction of the Tōkaidō, which was republished having changed it for years to come, beyond all recognition, shows us the longstanding popularity of Hokusai's 53 Stations of the Tōkaidō. We’ll be exhibiting pieces on the Tōkaidō created by Hokusai's disciples, as well as works that were influenced by Hokusai's paintings so that the public can appreciate the legacy of Hokusai’s work. *Use of these tickets is limited to the day on which the exhibition is visited, and allow only for permanent exhibitions.